The Long & Short. (June 30, 2017) Projected Annual Return (PAR): Long term return forecast based on fundamental analysis and five year time horizon. Quality Ranking: Percentile ranking of composite that includes financial strength, earnings stability and relative growth & profitability. VL Low Total Return (VLLTR): Low total return forecast based on 3-5 year price targets via Value Line Investment Survey. Morningstar P/FV: Ratio of current price to fundamentally-based fair value via www.morningstar.com S&P P/FV: Current price-to-fair value ratio via Standard & Poor’s. 1-Year ACE Outlook: Total return forecast based on analyst consensus estimates for 1-year target price combined with current yield. The data is ranked (descending order) based on this criterion. 1-Year S&P Outlook: 1-year total return forecast based on S&P 1-year price target. 1-Yr GS: 1-year total return forecast based on most recent price target issued by Goldman Sachs. The rate of return for the tracking portfolio is 15.2% since inception. The relative/excess return for the Fave Five tracking portfolio is +0.2% since inception. 45.7% of selections have outperformed the Wilshire 5000 since original selection. Few things are more contagious than emotions. One of our biggest challenges is to prevent emotions from clouding long-term perspectives. I believe that core fundamental growth and profitability is intact and that the assumptions and judgments that we make during our stock studies do not require massive adjustment. Long-term growth expectations may be slightly subdued but the impact probably isn’t all that material. If you believe as I do, then it follows naturally that some excellent companies are available at reasonable prices. The events of a certain bright September morning brought us to our knees. Those memories will never leave us. Our awareness of the passage of time was, at least temporarily, altered. Where days were once blurs and years and decades somewhat-defined horizons, instead the long term became blurred. In sharp contrast, the daily images burst forth in crystal clarity. Fear took on a precise nature. The damage became even more pervasive as an already weakened economy mightily struggled to regain its balance. The effort proved futile. First one, then another supposed paragon was exposed. Confidence was breached. Fiduciary faith is one of the more fragile varieties. Only the passage of time combined with an uninterrupted demonstration of credibility and reason will restore consumer confidence to necessary levels. Trust is still the biggest component of any P/E ratio. Better Investing for Better Living. Our theme is timeless and in many ways, immune to the challenges of this past year — so long as the long-term perspective is maintained. NAIC co-founder and Chairman Emeritus Thomas O’Hara reminds us: “Times like these are when it is most challenging to capture the attention of would-be investors.” The distraction of a bear market is unfortunate. These times are also the best time to start (or augment) a lifetime program of strategic long-term investing. A friend once commented that during market breaks, it seemed like his best clients would throw bricks through his office window. He didn’t mind the shattered glass so much. 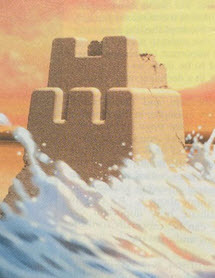 (After all, we build castles from sand.) But what he really wishes is that they would tie a few dollars to the brick before launching it. Then he would be enabled to invest on their behalf — in excellent companies, at good prices — when it was easier to do so. The preservation of faith and corporate credibility is an overwhelming responsibility. The actions of a few have grievously undermined confidence. Cardiac vision has been blinded and the moral melee has become a maelstrom. Seeing every single corporate [data point] has never been what [our investing method] is all about and I hope it never will be. This circus will be over when an executive can talk to us without inhibition. That day will come. We will indeed return to building castles by the sea with the knowledge that tides, erosive winds and castle-smashing vandals are a fact of life. Sand castles are naturally swept away. Sand-castle virtues are precious and deserve better respect. The Long & Short. (June 2, 2017) Projected Annual Return (PAR): Long term return forecast based on fundamental analysis and five year time horizon. Quality Ranking: Percentile ranking of composite that includes financial strength, earnings stability and relative growth & profitability. VL Low Total Return (VLLTR): Low total return forecast based on 3-5 year price targets via Value Line Investment Survey. Morningstar P/FV: Ratio of current price to fundamentally-based fair value via www.morningstar.com S&P P/FV: Current price-to-fair value ratio via Standard & Poor’s. 1-Year ACE Outlook: Total return forecast based on analyst consensus estimates for 1-year target price combined with current yield. The data is ranked (descending order) based on this criterion. 1-Year S&P Outlook: 1-year total return forecast based on S&P 1-year price target. 1-Yr GS: 1-year total return forecast based on most recent price target issued by Goldman Sachs. The relative/excess return for the Fave Five tracking portfolio is +1.1% since inception. 44.9% of selections have outperformed the Wilshire 5000 since original selection. KORS has now dropped more than 20% more than the market (Wilshire 5000, VTSMX) since it was added via the Fave Five on 1/19/2017. 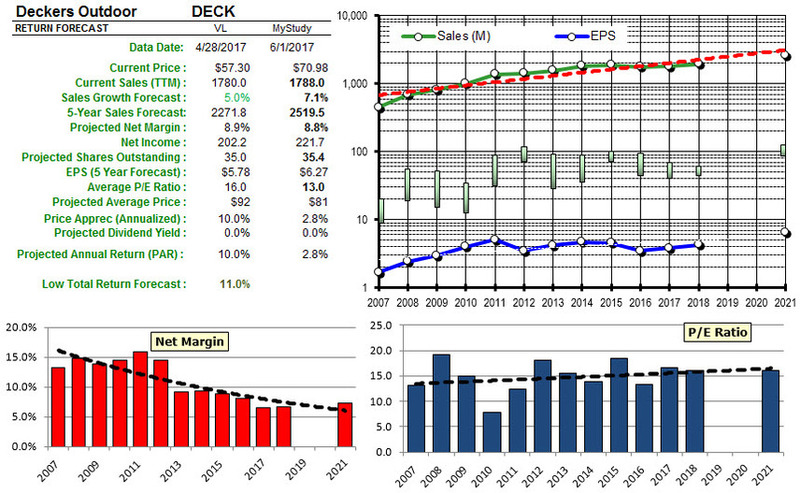 Deckers (DECK) has performed very well since selection back on 10/27/2016, beating the Wilshire 5000 by +27.3% but it lands on the “hot seat” by virtue of its torrid performance. The decision is made “to take the money and run” and sell Deckers (DECK) based on this audit of current conditions.